Newport Gwent Dragons players' futures could be on the line when they face Ospreys in Sunday's Pro12 double-header at Cardiff's Millennium Stadium, says director of rugby Lyn Jones. 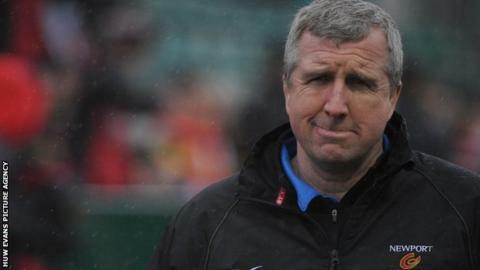 The former Ospreys coach hopes his players take the chance to "show the rest of Wales how good they are". He added: "All of the players have got futures to play for and we're hoping for a spirited performance." Scarlets face Cardiff Blues in Sunday's first game. Former Wales international Jones believes everyone on show should be looking to enhance their reputation. "Players are always playing for their futures, whether they are with the Gwent Dragons or other clubs," said Jones. "That's very important for all rugby players, no matter who they are playing for, to remember." Dragons go into Sunday's game on the back of last weekend's 45-27 defeat at Treviso, which leaves them 10th in the Pro12 table. And Jones, who took up his role at the start of the campaign, admits his team have underachieved during the second half of the season. "We started the season particularly well, but [have] fallen away drastically," he said. "We've had a disappointing month leading into this game, but it's a high-profile weekend with two local derbies. "We totally appreciate that they're hot favourites. But we've got to control what we can control, step up and play in their faces and put them off their stride." Jones, who coached the Ospreys to Celtic league titles in 2005 and 2007, says his former side are "still the leading light in Welsh regional rugby". He wants the Dragons to emulate their success in the long term, saying: "They're probably six or seven years ahead of us at the moment. "We've got some catching up to do. I don't think it's going to take as long as that to catch them up. "But certainly we've got lots to work upon to get a side and a business that's going to be developing talent to perform for Gwent Dragons in a higher competition in rugby, as well as developing talent to play for Wales."